ISLAMABAD: Leaders of the protesting Tehreek-i-Labbaik Ya Rasool Allah (TLYR) on Sunday have turned down government’s proposal to send the law minister on leave or reshuffle his portfolio, according to a report in a local English daily on Monday. A number of possible options were reportedly presented by the government’s negotiating teams to the sit-in leaders in return for ending the protest, but none was accepted. Among the topmost demands of the protest leaders is the law minister’s removal from the cabinet, but the government refuses to accept this demand. However, according to the report, the government has decided to send the minister along with his family abroad, in case the protesters decide to end the protest, as a number of threats have been received by the law minister. The government team, led by Raja Zafarul Haq, leader of the house in the Senate, consists of around 30 people including legislators, clerics and representatives of the pir of Golra. Raja Zafarul Haq said that though the high court directed the police to clear the Faizabad protest at all costs, the government was still taking its time so that the issue could be resolved peacefully. On Sunday, Interior Minister Ahsan Iqbal again appealed to the protesters to end their dharna, saying that no government can ever compromise on the Khatm-e-Nabuwat’s belief, and the parliament has always upheld it. Addressing a press conference in Islamabad, Ahsan reiterated the government’s desire to end the deadlock through dialogue rather than by means of force, urging the protesters to end their sit-in, as the sacred issue is being abused for political purposes. “People want to make this issue a political launchpad. But paving way for violence through such protest is unacceptable,” he said. Stressing that Prophet Muhammad (PBUH)’s teachings called for a tolerant society, he said that the Tehreek Labiak’s protest was contrary to that. “Prophet’s teachings are of tolerance instead of calling names to others from a stage. This is not consistent with Islam’s teachings,” he said. “Why protesters were trying to create an atmosphere of chaos during the upcoming holy month of Rabi-ul-Awwal,” questioned the interior minister. Responding to protesters’ demand of removing Law Minister Zahid Hamid, the interior minister reiterated that he would not be removed from the office. “How can we remove the law minister? If we start doing this, every other day, people will make similar demands,” he said, adding that so far, the government has dealt with the matter rather patiently. 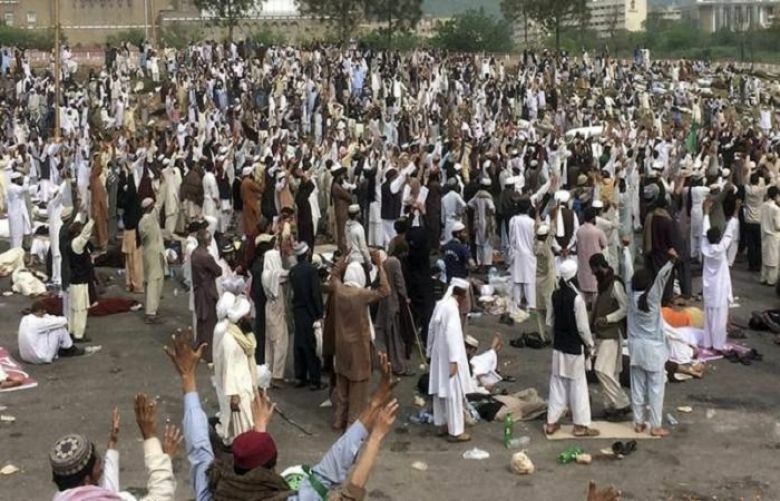 He implored the protesters and their leadership to agree to the government set-up committee consisting of Islamic scholars who are also asking the Tehreek Labbaik to end the protest. The interior minister reiterated that compliance with the IHC order to remove the protesters by Sunday was a legal requirement, but added that he had requested the court, especially for an extension in the deadline, in order to reach a peaceful resolution to the deadlock. “We agreed to the suggestions they had, and I hope the protesters and their representatives will also reach an agreement so the issue can be resolved and people’s lives can return to normal. If all reservations have been dispelled and the law has been reversed, there is no more justification for the sit-in,” he said. People’s daily lives, children’s academics and businesses have all been affected by the 14-day long protest, he said. “The sit-in would only benefit the enemies of Pakistan, as a high-level delegation from China was due in Islamabad on Monday for 7th Pakistan-China Joint Cooperation Committee meeting,” he said. Regarding the presence of armed people among the participants of the sit-in, the minister said some subversive elements wanted to take advantage of the situation. He said that protesters should congratulate the government for the historic work of restoring a law that had lapsed in 2002 and now, the Khatm-e-Nabuwwat issue had been settled once and for all. He said a 30-member delegation of ‘Ulema and Mashaikh’ last day were also taken on board to resolve the issue in a peaceful manner. He said the matter had already been settled down once for all and it should not be politicised, keeping in view of its sensitivity as the error in the Electoral Reforms Bill-2017 had been undone.